Are you aware of the massive purchasing power of women? →Women are responsible for a whopping 85% of consumer purchases. →In nearly 75% of households, women are the primary shoppers. →In the US alone, approximately 40% of working women earn more than their partners. →Women will be in control of two-thirds of all consumer wealth in the US in the next 10 years. Over 90% of women say they have significant influence on what financial services their family purchases. You know how valuable referrals are to your business growth – but did you also know that female clients who are happy with your services will make over twice the referrals of male clients? That's right! Women will make 26 referrals - compared to only 11 referrals made by a typical male customer? Women are also more likely to share a post on social media, refer friends and share their experiences with family and acquaintances. Once they feel valued by their financial professional, women are loyal customers. Yet despite women being the most powerful market, women report that insurance and financial professionals overlook them as valued consumers. →Earn their hard-earned dollar, for their lifetime, and their family’s lifetime! 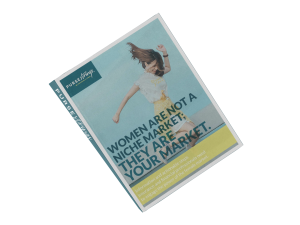 Download our FREE Guide to Wow the Female Market here. It includes tips you can use right now!